Here are the main UI differences between the Classic and Orion dashboards. With Orion we have achieved a better workflow by reevaluating what our users need to fulfill everyday tasks. 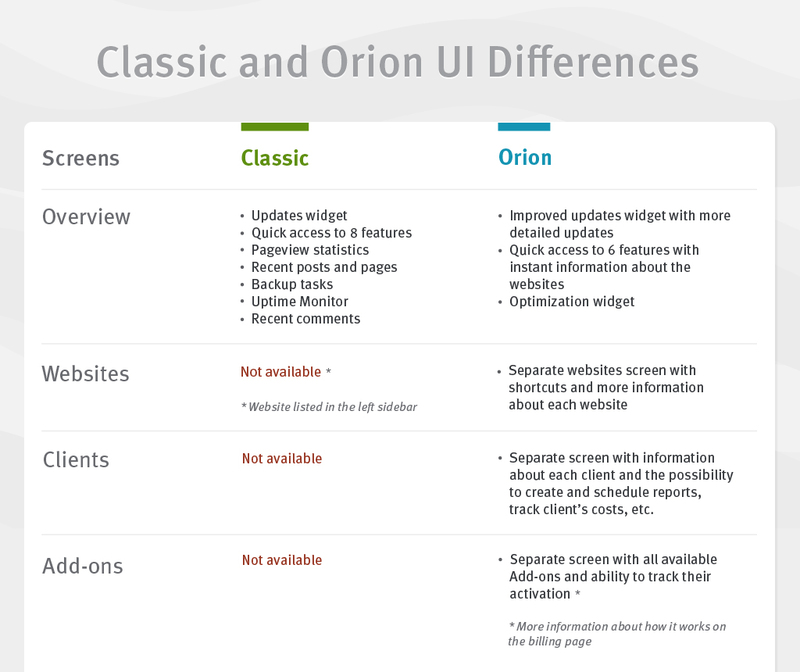 All information available in the Classic overview can be found in the Orion Overview screen, and more. Updates widget. It’s divided into 3 sections: Plugins, Themes and WordPress Core updates, so you can have a better look at what needs to be updated. Services widget. Quick access widget in Classic allowed you to access some of the features with one click, while the Orion Services widget shows you summed information at a glance, and gives you the option to seek out more information for each tool. Optimization widget. This widget has been added to Orion only. You can use it to clear spam, post revisions and optimize the database with one click. Comment widget. This allows you to approve or mark comments as spam on your websites. Like in the Classic, there is a Drag & Drop option in Orion and you are able to move the widgets and arrange them in a way that best fits your workflow. Orion has a completely separate screen for your websites. By clicking Websites on the left, you will see all websites that are added to your dashboard. List view shows you a list of all websites alongside with their name, connection status and URL, WordPress version, as well as clients and tags that are assigned to the website. For those that prefer a visual view, there is a thumbnail view that allows you to find the appropriate website quickly. In each view, hovering over a website will show you four buttons: single website dashboard, one-click login to WP-admin dashboard, backups screen and site settings. Orion also has a way to easily filter websites. You can filter the websites by add-ons that are active, status, tags (that you can create and assign to a website), clients, WordPress version and language. Orion has a separate client’s screen where you can manage all of your clients (add their info, see the expected monthly cost based on the add-ons that are activated on their websites, create a client report, etc.) and add new ones. To get to know your ManageWP Orion dashboard better, have a look at our walk-through.